This set of three brightly coloured A2 sized posters presents information oh how to prepare for exams, get motivated and take visual notes. Each poster comes with an information sheet that explains the mind map content in detail. 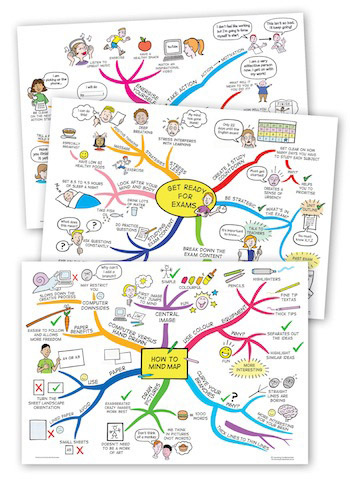 The Study Skills Mind Map Poster Pack is a set of brightly coloured A2 sized mind map posters designed to provide students with a range of practical study strategies. Each poster contains appealing illustrations aimed to engage visual learners and comes with an explanation sheet to explain the mind map content in detail. The pack includes three posters: Get Motivated, Get Ready for Exams and How to Mind Map. These mind map posters have been specially designed for high school students who are entering their final years of schooling.